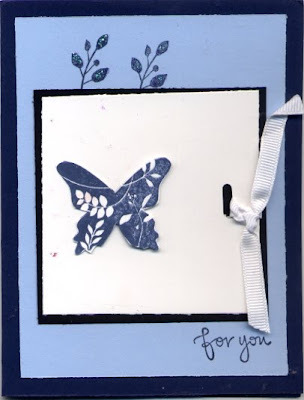 I am not going to talk about my cards since there will be so many, but if you want to know how to do a particular one, just email me. 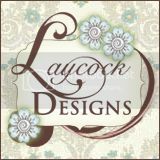 I am getting ready for our County Fair and I am trying to make as many cards as I can before then. I found last year that they sold like crazy. 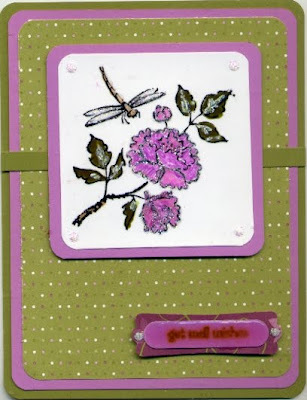 I have been busy with other stuff so haven't had time to make many cards. This was for a challenge for punch art. 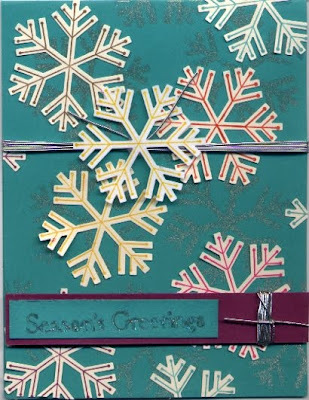 I used all in colors and used what was left from the punched snowflake as a stencil to apply the shimmer paint onto the card. 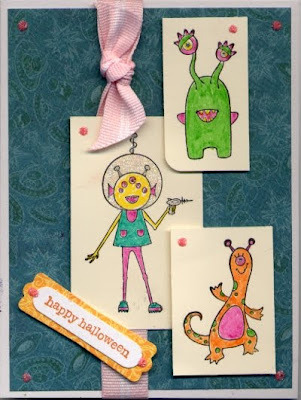 Here are cards I made last night and today. 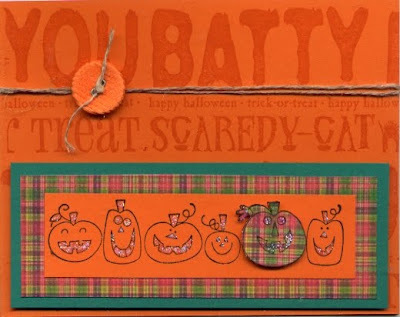 I was still using the stamp-a-ma-jig for this project. I think you need it for something like this. Notice how I used the curve of Hello There around the gourds. 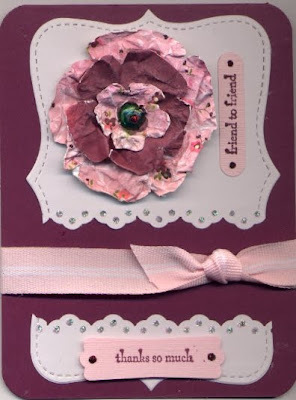 I cut a bunch of circle in the same card as the card base and attached them to the base. It really gives it a neat look. 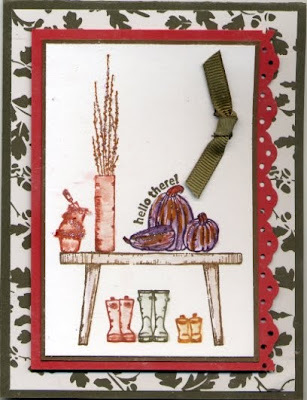 I also stamped this image twice, using the stamp-a-ma-jig. 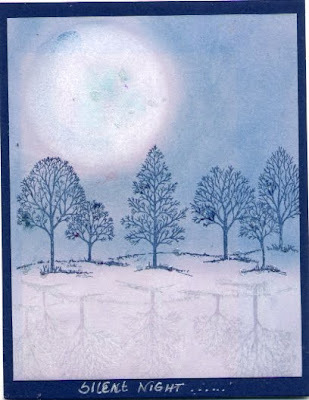 The first stamped image was in color and the second was with the shimmer paint. It is really hard to tell from the picture, but it is really pretty. I got this set and I really don't know why since I have no little kids around but this is the second I have made. 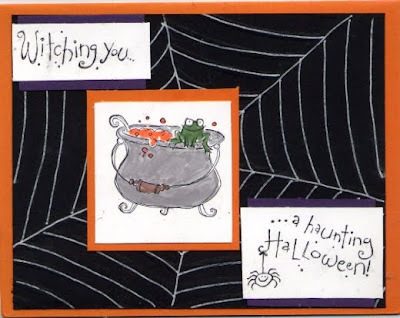 I decided to make it into a halloween card. This last one was my favorite until the stickles messed up. But you can't get everything perfect. I tried to fix it the best I could. 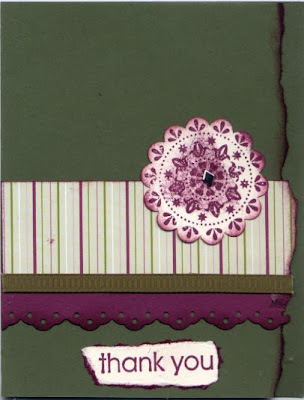 I used the shimmer paint stamped image under the razzleberry Ink image. If you saw it in person, it looks a lot better. Hope you enjoyed todays cards. Please make comments on the cards you like. 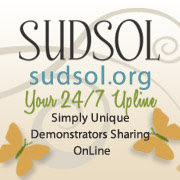 I want to sell a lot at my local county fair and I would like to know what people like and don't like. I don't want to make a bunch of cards that I might like but no one else does. Comments do help. Thanks. 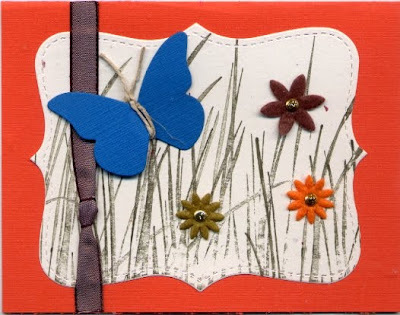 This is a card made by my SS as an example of a hinged card that I am to make. It is the first one I have seen and it will be my first one to try. I love to try new techniques. 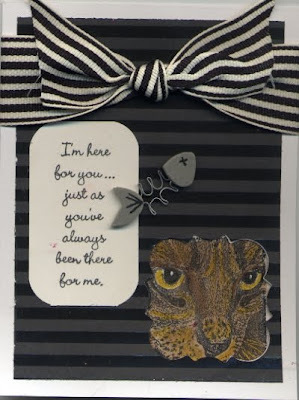 This card was from Miranda. 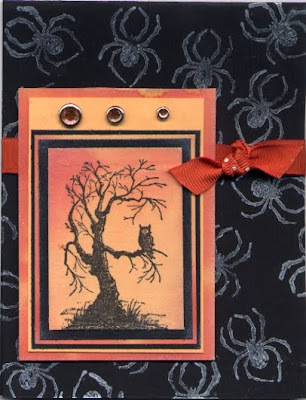 I love how she used the spider web folder and went over it with white ink. 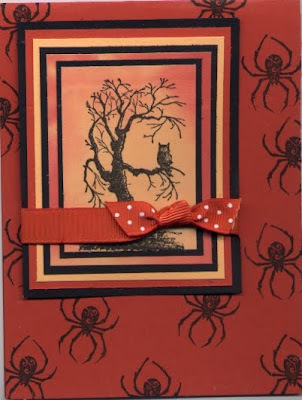 I have been doing a few Halloween cards myself. I love Halloween, although this will be the first year that I won't have kids in the house all dressed up giving out candy to the little ones. 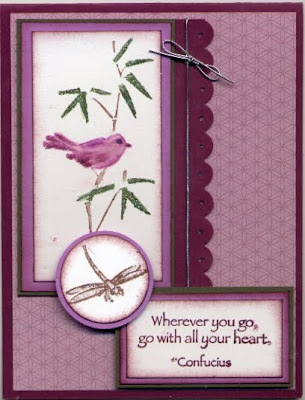 This card was made by a friend of mine Carol Marbach. I met her through UDI or LNS and then on Facebook. 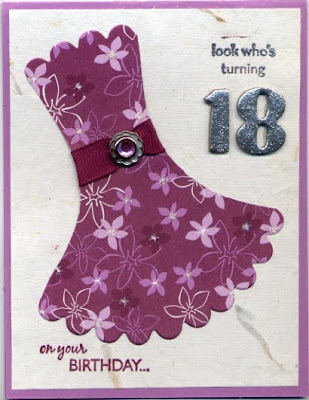 I love this card, although she didn't particularly like it. Here are some cards I made last night. 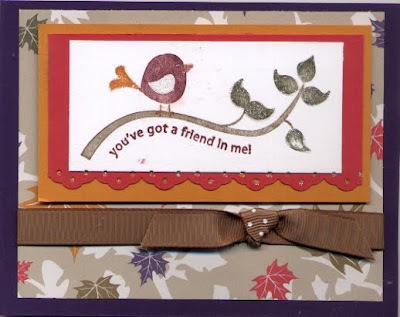 I am a bit of a night owl and when I found out they cancelled Jury duty, I began making cards. This first one is plain and simple. 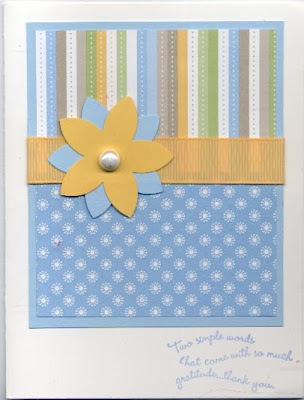 I did use the stamp positioner called the Stamp-a-ma-jig on this card. 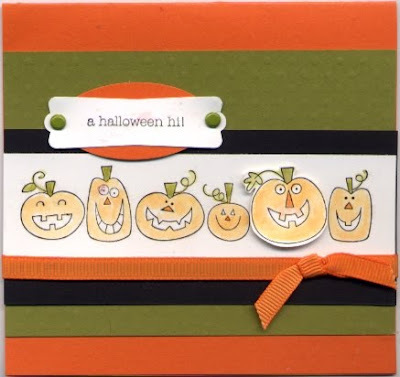 I have been stamping for many years and I can eye most things but I have found that it only takes a second to use this tool and it makes every stamp line up perfectly. I don't know how I lived without it. 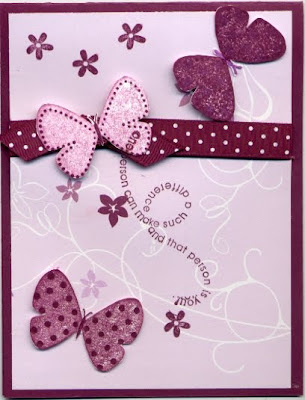 This is another simple card but I love the design if I do say so myself. 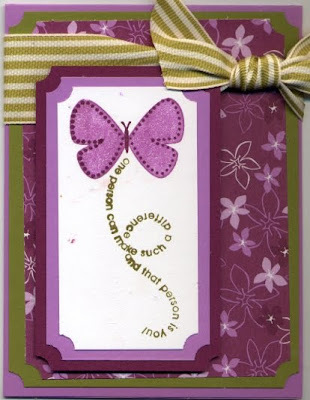 This on I did not use the stamp positioner on the sentiment and of course it shows. I thought I could eyeball it but it didn't work, but I can't throw the card away so here it is. 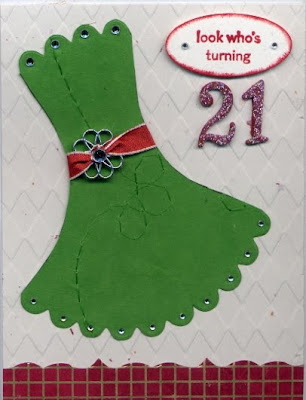 This is another simple card that also used the stamp positioner. It does make life a lot simpler. 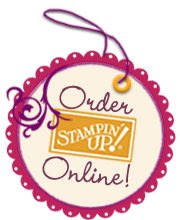 I stamp on card stock vellum and keep them with the stamps. That way I always have it ready. Hope you enjoyed the cards. 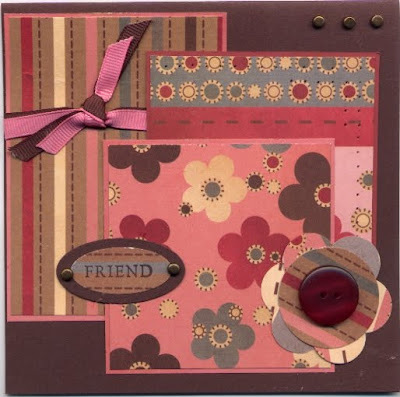 All used the colors set by the DSP paper I used. 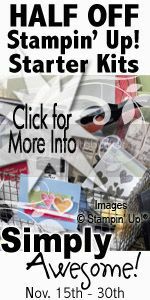 Labels: My Card Creations, Product uses. Here are four cards I did today. Actually only 3 I did today. This first one was done some time ago but it has been one of my favorites and only a one layer card that I thought I would share it. The look is done totally with chalk. 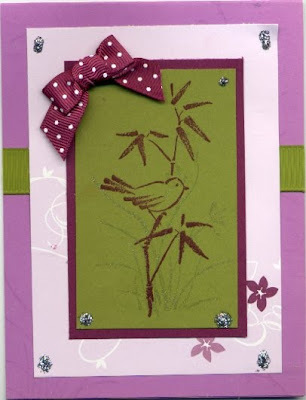 I keep forgetting about our chalks and then I take this card out and tomorrow I will do some cards with chalk. 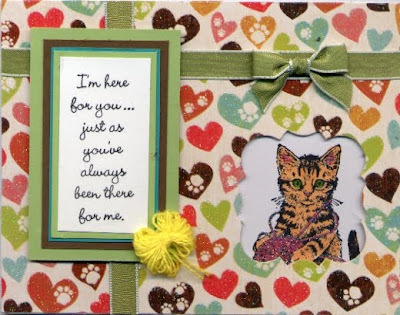 This is another like the one I did yesterday but with a different cat image and dsp paper. I decided to dive and and try the treat cups on the cards. They are a lot easier to use than I thought. 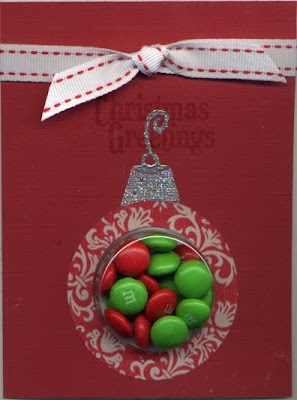 I just bought a big bag of M&M's and matched the colors to the season. I used the circle cutter to make the outline of the punched circle that the treat cup fits into. It made the ornament look a lot better. 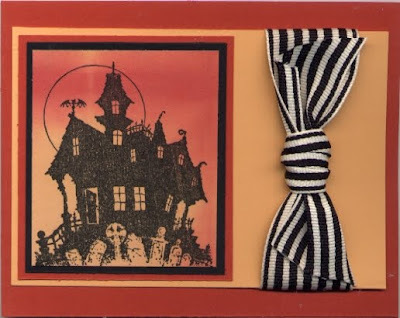 This, of course, it the halloween one. 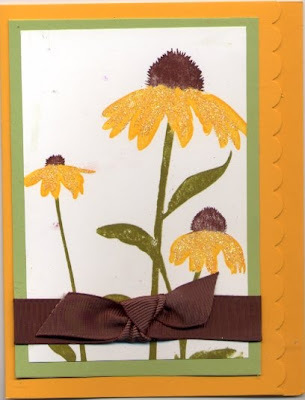 I used the cut out of the stamped image and a rub on for this card. 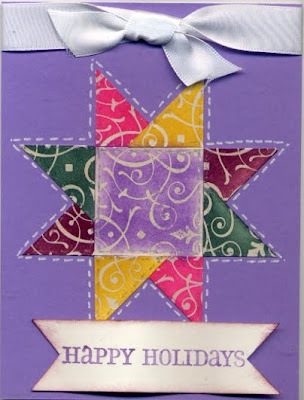 Here are some more of Kims designs that she did for her class last month which I could not attend but she had the kits made up and I took them home and worked on them myself. I have one more to do but here are two of them. Aren't they wonderful. 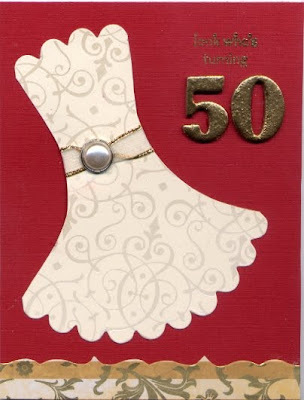 This is a card made mostly from Big Shot Dies. This was just an experiment. 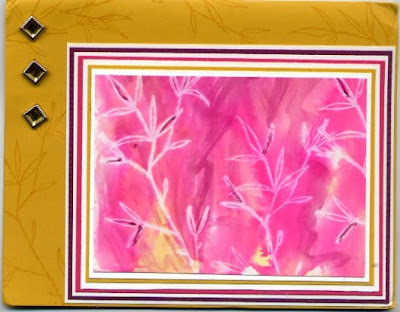 This was cased from a flood card I received but I embellished on it. I really like the look. 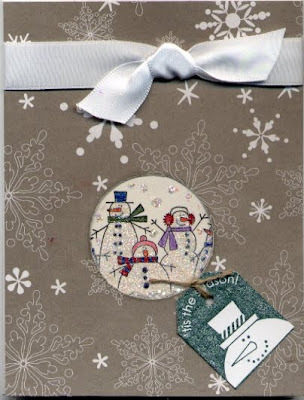 Except for the paper and ribbon, I think the rest was given to me by my Stamping Sister. She knows I love cats and gave me a couple of stamps. I thought the Shapes and movers die worked well with this stamp. Let me know how you like it. Here are some more flood cards I have received. 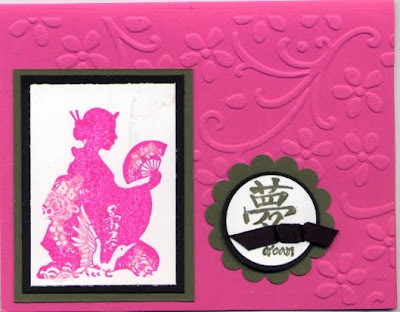 I love this oriental one. 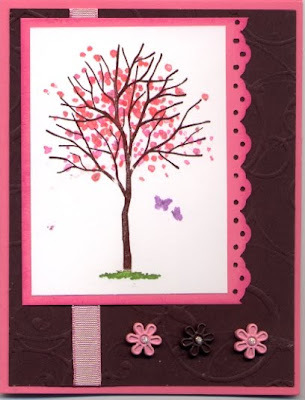 The SU embossing folder goes well with this design. 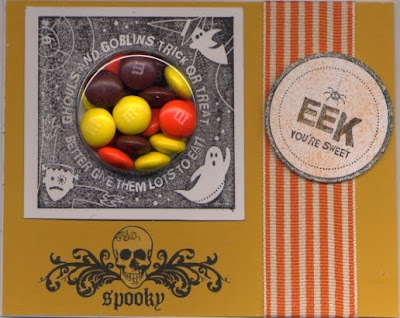 This is a stamp set I have been debating about getting. 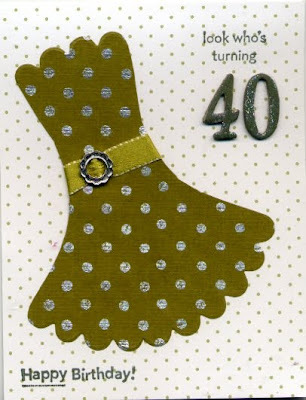 This card came from Kathy Gayken. 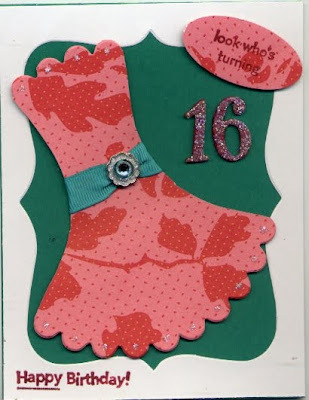 This card came from Lynda Jaggers and she is loving this swap. 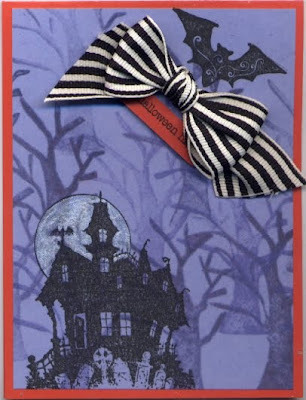 I like the destressed look of this card. 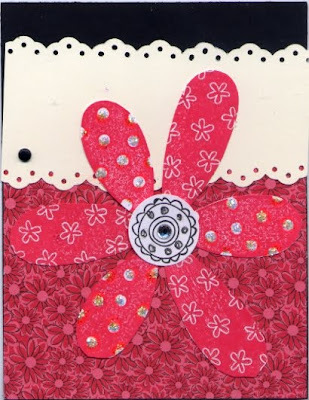 This card is from Kimbery Kawal and she gave the directions on how to make the card and who she cased it from. Great idea to do that but more trouble than I am willing to do so thanks. 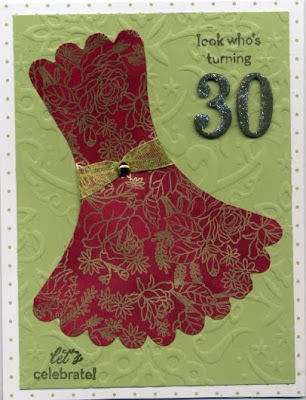 I love this card. I can see why she cased it. 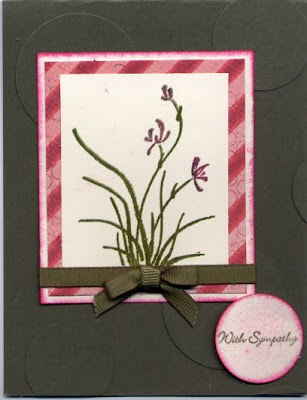 This came from Alicia Wiley and it is one of those simple yet elegant cards I just love. I just can't seem to do them. 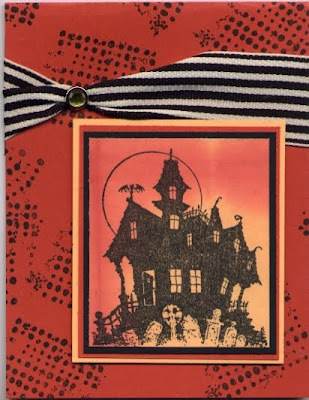 This last card came from Gina Starr and I just love Halloween Cards. I have finally earned enough to get this set and I'll get it next week sometime. I love how you popped up one of the pumpkins. Just Love It. Now that my time is ending, I appreciate all the cards I have received. Thanks again.